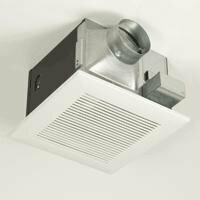 When purchasing exhaust fans for your home, be it in the kitchen, bathroom (Figure 1) or for general ventilation, there are numerous considerations. One of those considerations should be the noise that the exhaust fan will produce. The motor and fan spinning. The air traveling through the duct work and to the outside. Dirt and grime on the vent screens, fan blades and housing. Reducing noise created within the duct work is generally accomplished by shortening the distance from the exhaust fan to the outside, reducing the number of elbows in the system, changing from flexible pipe to rigid pipe and/or softening the curves within the system. A shallow curve will have less air flow noise than a tight curve. In other words the air traveling through two 45 degree elbows will make less noise than the air traveling through one 90 degree elbow, as shown in Figure 2 and 3. An exhaust fan that has a noise level of 4 sones is louder than an exhaust fan that has a noise level of 1 sone. In other words, the lower the sone number, the quieter the fan. As a general statement, an exhaust fan with a lower sone level rating is an overall higher quality fan when compared to an exhaust fan with a higher sone level rating. As an example, ball bearing style bearings are quieter than brass bushing bearings. Ball bearing style bearings will also last longer than brass bushing bearings. They are also more expensive. Noise is also reduced by using thicker metals for housings, stronger motor mounting brackets, balanced fan blades and tighter tolerances for the basic exhaust fan construction. Note: The sone level will increase with the age of the exhaust fan as bearings begin to wear. The more dirt and grime that is on the vent screens, housing and the fan blades, the more exhaust air flow constriction. Air flow constriction creates noise, not to mention that it makes the motor work harder to exhaust the same quantities of air. The internal housings, vent screens and fan blades of all exhaust fans should be inspected and if necessary cleaned at regular intervals. As a general statement kitchen exhaust fans, because of greases and oils that are put into the air when cooking, must be inspected and cleaned more often than an exhaust fan in a bathroom. Unlike a lot of measurements that are easy to visualize, such as a foot or yard, the sone is not something that most individuals can easily identify with. Table 1 provides a sone level comparison with noise levels that most of us are familiar with. This should aid the homeowner in determining what sone level they will find acceptable for the exhaust fan in any specific location in their home.